East Lansing approved several renovation and construction projects in 2016. This is all in an effort to reconstruct the city and make it more appealing. There are new businesses and apartments being constructed and renovations to existing buildings. This renovation is part of an effort to update and modernize some of East Lansing’s older and more historic buildings. Renovating an older building includes refurbishing older living spaces and sometimes even remodeling the interior of the whole building. By modernizing older buildings East Lansing becomes a more modern and appealing place to live. This can be seen in the restoration of the East Lansing Public Library. The library which was renovated from Aug. 26-Sept. 30 added new furniture and shelves to the building. When there is a new building being constructed the buildings tend to be build up rather than out. A smaller sized lot costs less and also building up allows for the new building to be multi-purposed. Having a multi-purposed building that has apartments and a department store in adds to the appeal of living there and in East Lansing. One such restoration of an older building is happening at Liberty Hyde Bailey Center on 300 Bailey St. The project is turning a former elementary school into a new apartment building with large common areas. There will be 30 apartments on a 9,000-square-foot lot. The apartments will be sold to seniors ages 55 and up. The project has an estimated cost of $6 million. 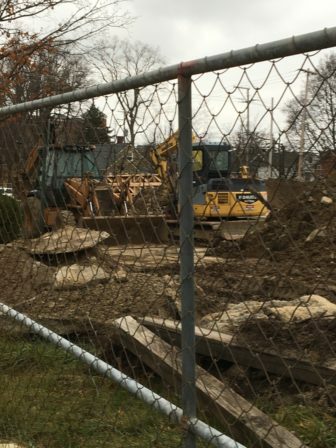 Most of the construction in East Lansing is happening on or around Grand River Avenue. The Stonehouse Village construction project at 565 E. Grand River Ave. is being undertaken by Cron Management, LLC. Located between a Moosejaw and Bailey Street, this 6,745-square-foot lot will be turned into a five-story multi-purpose building. The first floor will be commercial space with shops and restaurants. The other floors will house a mix of two-, three- and four-bedroom apartments. These units are intended for Michigan State students. The estimated cost for this project is $8 million. “If you can locate everything downtown, then it puts less stress on the roads since people will be more apt to walk or bike everywhere since everything is so close,” said Helzer. Many new projects have more than two floors and are multi-purposed buildings. The Park District Planning area is also trying to demolish and reconstruct on the corner of Grand River Avenue and Abbot Road. These buildings will follow the same mold as the one on 565 E. Grand River Ave. and be vertical projects. Five sites are part of this proposal. The buildings on 100 W. Grand River Ave. and 140 W. Grand River Ave. have yet to be knocked down. The other three, located at 341 Evergreen Ave., 345 Evergreen Ave. and 303 Abbot Road, have been razed. The largest construction project will be happening away from downtown East Lansing at 5800 Lake Park Road where a new Costco Wholesale Warehouse will be built. The building will be 156,170 square feet and will take up about half of the 64.7 acres where the Four Winds Golf Course was. The estimated cost of the new Costco will be about $30 million. The reconstruction happening at the Mayberry Homes in and around Virginia Avenue is focusing more on redeveloping roads and sidewalks. The same can be said about the East Village project (which is outlined on the Google Map).